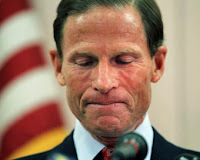 Mr. Blumenthal’s jump in net worth – from $73 million in 2010 to $112 million in 2011 -- makes Connecticut soon to be senior senator the fourth wealthiest member of the Senate and the ninth richest among all 535 members of Congress. Mr. Blumenthal replaced former Senator Chris Dodd, author of the Dodd-Frank Bill, a mischevious regulatory waterboarding gag placed over the blistered body of American enterprise. Like Mr. Blumenthal, Mr. Dodd was a relative pauper when he left the Congress to accept a position as a Hollywood lobbyist and the head of the Motion Picture Association of America (MPAA). Since then, fortune has smiled upon the former senator. Mr. Dodd patiently waited to leave the hallowed halls of Congress before cashing in on his years of service. Mr. Blumenthal brought his wealth with him when he stepped into Mr. Dodd’s empty senatorial shoes. "Candidly,” the new head of Tinseltown warned, “those who count on quote 'Hollywood' for support need to understand that this industry is watching very carefully who's going to stand up for them when their job is at stake. Don't ask me to write a check for you when you think your job is at risk and then don't pay any attention to me when my job is at stake." Dodd’s effort to badger politicians into supporting SOPA came to grief when, objecting to language in the bill that granted the U.S. government the right to block from the internet entire Web sites carrying copyright-infringing content, some sites such as Wikipedia, Reddit and Boing Boing shut down theiroperations in protest and blacked out their services. Others have pointed out that the Buffet Rule could easily be self-applied by all three of the Democratic millionaires who serve in the state’s congressional delegation: Mr. Blumenthal and U.S. House members Rosa DeLauro and Jim Himes. None of Connecticut’s millionaire congresspersons appear to be willing to put their tax money where their mouths are; and that includes,of course, Mr. Buffet. In 2010, a Hearst newspaper asked Mr. Blumenthal to furnish it with the cover page to his most recent IRS filing for a profile the paper printed in March. . The profile does not include information from the requested filing, which suggests Mr. Blumenthal did not furnish the requested information in time for publication. It may be important during the campaign season now upon us to ascertain from Mr. Blumenthal whether he has paid more or less in taxes during his time in office -- which would include his 16 years as Connecticut’s Attorney General -- than, say, former Governor of Massachusetts Mitt Romney, whose tax payments have been questioned by President Barack Obama and Mr. Blumenthal’s Democratic colleagues in the U.S. House. A fair, simple, effective flat tax would assure that millionaires such as Mr. Blumenthal would, like ordinary mortals, pay the same tax rates as their secretaries, which could be computed on a form the size of an index card and would dispense with the complex and expensive tax avoidance apparatus that has made the progressive tax into little more than a joke easily circumvented by millionaires who can afford to hire armies of lawyers and accountants to protect their assets from raids by such as Mr. Blumenthal. The easiest way to level the playing field between millionaires and their secretaries is to expropriate all the assets of millionaires when they die, thus preventing the flow of wealth to their children. The assets easily could be dedicated as a down payment on the present $16 trillion Bush-Obama national debt or be distributed to soup kitchens and those who live under bridges. This elegantly simple reform, which once and for all would dispose of the problem of monetary inequity and sooth the anxieties of millionaire congresspersons such as Mr. Blumenthal, Mr. Himes and Mrs. DeLauro, is not likely to be approved by any of Connecticut’s Democratic congressional millionaires.